This article first appeared in The Great Outdoors a year ago. 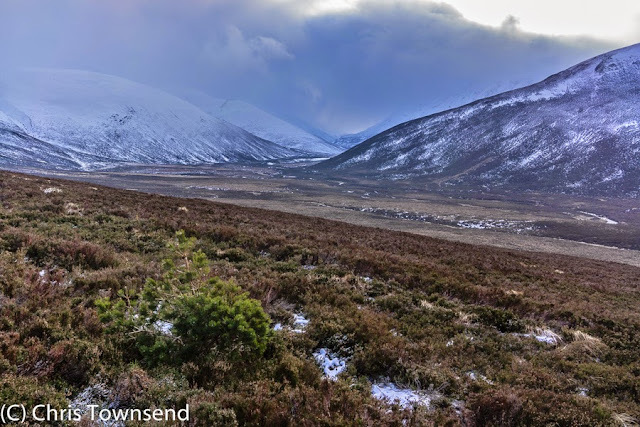 I've been thinking about rewilding, forests and land use recently and have had various discussions on social media sites on related topics so I thought I'd post it here. How wild and natural should the hills be? Do you want them tame and docile so the walking is easy and secure? I ask in response to an online comment from a TGO Challenger who likes sheep in the hills because they make walking 'very pleasant'. Now sheep-cropped grassland certainly is easy to walk across but it's also an artificial and biologically degraded landscape. 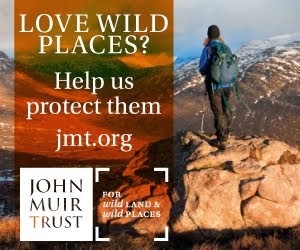 Natural landscapes are wilder, more diverse and, for the walker, more challenging. Where the terrain is impossibly tough - dense forest, tangled bushes - the answer can be a path. I'd rather see a narrow trail through a wild and natural landscape than sheep-cropped terrain where it's easy to walk anywhere. And if there's no path then I'd rather find a way through the difficulties than have them tamed. 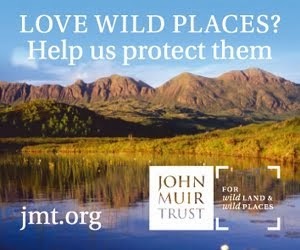 A bigger question is how to achieve more natural and diverse wild lands. Just what does that involve anyway? Ideally I think it means leaving land alone, leaving it to be 'self-willed'. However whilst that's fine for pristine and near-pristine places it may not be for more damaged ones. The question then becomes how much interference and management is acceptable. In turn this raises the question of how long you want to wait and whether the rewilding of a landscape can be speeded up. The answers vary depending on your outlook and aims. Aesthetically I think any management should be as unobtrusive and unnoticeable as possible. I also think such management also produces a more natural landscape in the long run. However I accept that in some places it just isn't possible, at least at present. Recently I was in Eskdale in the Lake District where some extensive tree planting is being undertaken by the National Trust. Because this is sheep country the planted areas are fenced and the trees are caged. This looks highly unnatural. In time I guess the cages and fences will be removed and the forest will look more natural though it will still have straight lines dividing it from the bare land outside it. 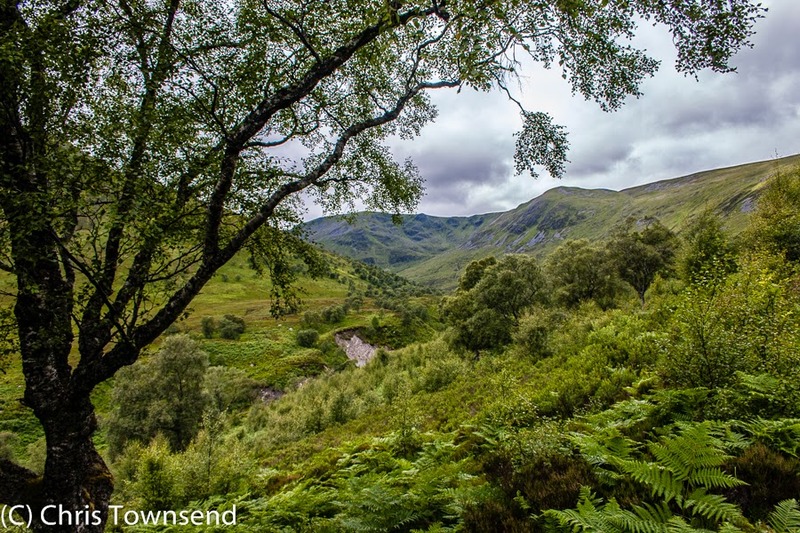 Less obtrusive is the work being done by Trees for Life in Glen Affric. Again planting is involved but the trees are not caged. The new forests are simply fenced in to keep out deer. Again the line between the rich vegetation inside the fence and the sparse boggy vegetation outside it is stark. Contrast these schemes, both of which I support, with that of the RSPB in Abernethy in the Cairngorms, a huge reserve that stretches from the forests around Loch Garten of ospreys fame to the summit of Ben Macdui. Having heard that the RSPB was to plant areas that as far as I knew were already regenerating and pretty natural anyway I contacted the RSPB to find out what was going on and was invited on a field trip so I could see for myself (thanks to Regional Director George Campbell for organising this and also to Senior Site Manager Jeremy Roberts and Ecologist Andy Amphlett). Before we headed out to look at the area the scheme was explained and I was shown detailed maps of the forest divided into different types of area. No planting was going on in the mature natural forest or in areas where there was good regeneration I was told. Overgrazing isn't a problem in Abernethy now as deer numbers have been reduced and sheep removed. However there is a wide band of higher ground where the sheep used to graze that runs up to what should be the natural treeline of 650 metres where there are no trees at all and so no seed source for regeneration. There are also areas of previously felled and then planted forest where many tree species are absent. It's in these areas that the RSPB is planting small groups of trees to provide a seed source. The planted areas won't be extensive, just small clumps, and there will be no cages or fences. Out in the field I was shown some aspen that had been planted on some heather moorland. I would never have know they weren't the product of natural regeneration. Higher up we found the last tiny pines, still well before the 650 metre line. It was clear that there would be no natural regeneration here for a very long time. The RSPB has set a 200 year goal for the return of the forest so even with the planting it will take a long time. For walkers there will be no discernable sign of this management, unlike in Eskdale and Glen Affric. That's because the RSPB owns the land and has control of grazing, which takes us back to the start of this piece and the question of what sort of landscape we want. For myself the idea of the returning forest is exciting and unspiring. I'll only see it beginning but that is a joy in itself. 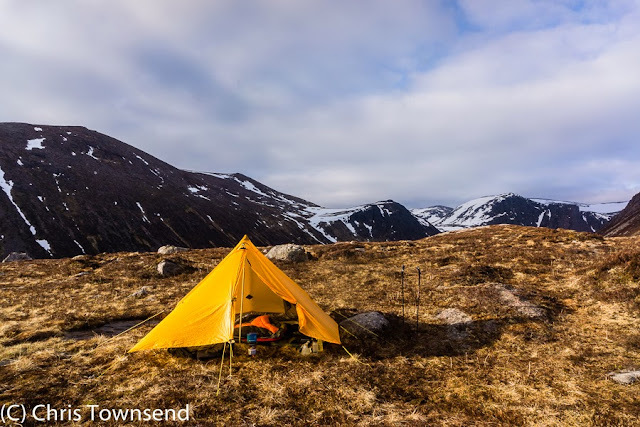 May has continued wet and windy and cold with hints of snow in the rain at low levels and scatterings of the real stuff on the tops. Much snow is left from the winter too. 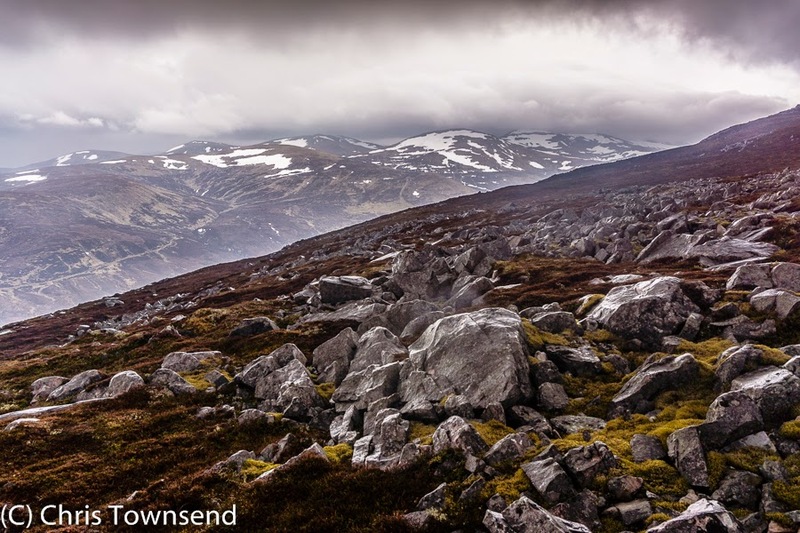 From Aviemore great snowfields can be seen on the walls of the Northern Corries of Cairn Gorm and the scalloped north face of Braeriach. 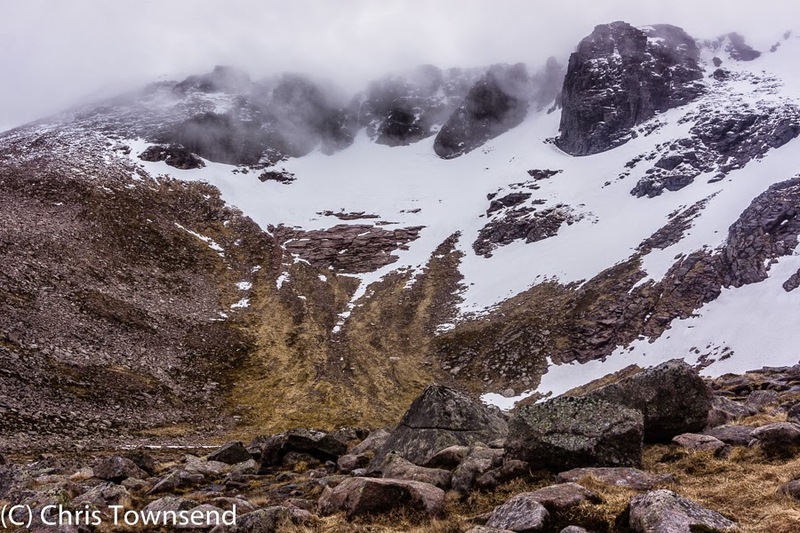 For a close-up view of the snow I wandered into Coire an Lochain on a day of racing clouds, patches of blue sky and a damp chill in the air. Below the dark cliffs high on the corrie’s back wall a wide band of snow swept across the slopes to merge with a much more extensive snowfield on the steep eastern flank, a snowfield that ran right down into the cold grey waters of the lochan that lies in the heart of the corrie. The snow isn’t as deep as it was in early June last year (see this post) but it actually covers a larger area. A speckling of fresh snow lay on the western sun-exposed side of the corrie. Although only a few miles from the car park it felt, as always, remote and wild here, the snow giving it a touch of the arctic. 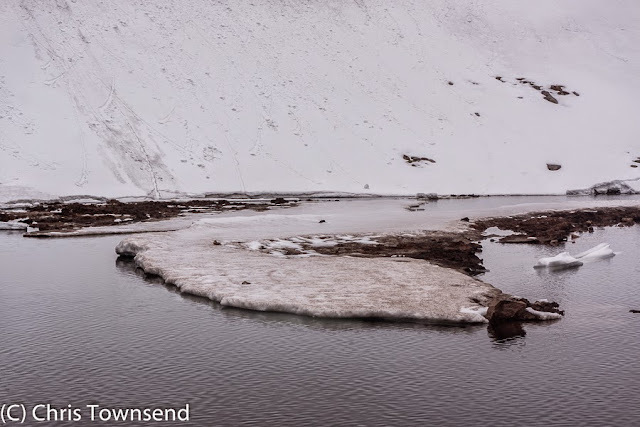 Wandering round the lochan I stared across its dark surface to plates of dirty snow floating in the water. Spattered with mud and earth these looked like the debris from avalanches. Many little slides were visible on the slopes above the lochan and there were bare patches where the snow had slid off. 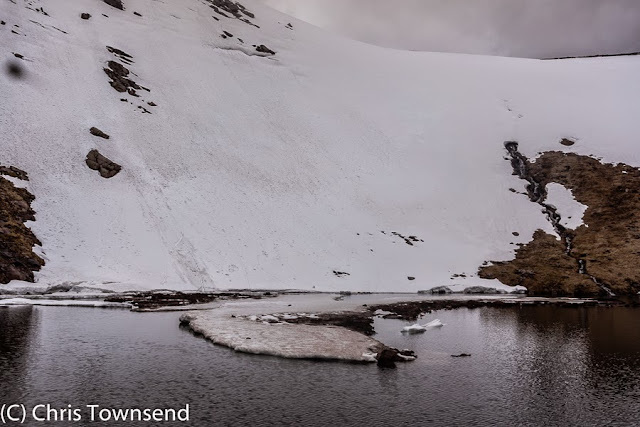 Turning away from the snow and the lochan I pondered on whether to climb to the summit of Cairn Lochan. The weather decided for me. 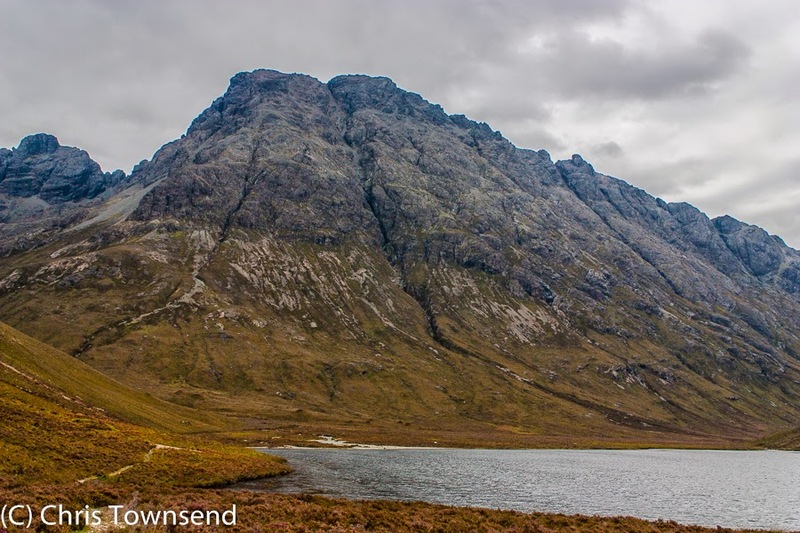 I had barely reached the corrie rim when I felt the first spots of rain on my head. I looked back. The clouds were descending over the crags. The rain became heavier. I headed for the car. Last week saw me on a visit south to Highland Perthshire to give a talk on my Scottish Watershed walk at the impressive Birnam Arts and Conference Centre. The talk was well-attended and there were plenty of questions afterwards so I think the audience enjoyed the evening. Giving this talk for the first time in many months I was reminded of just how stormy much of the weather had been, especially in the Northern Highlands. With fine weather in Birnam I was hoping for better conditions for a walk on my way home. It's always best to hope! 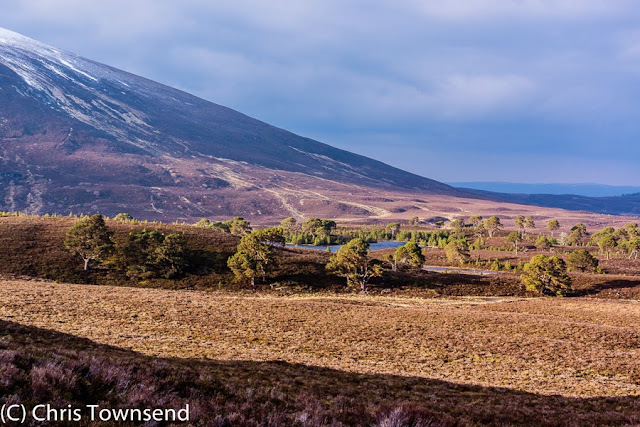 The JMT's property is the East Schiehallion estate which stretches up to the summit and includes Gleann Mor to the south of the mountain. 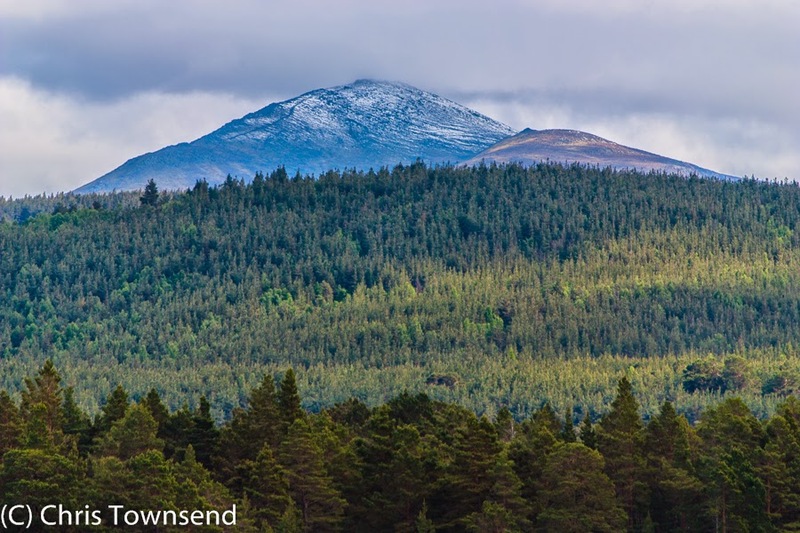 Schiehallion means 'the fairy hill of the Caledonians' but it's famous for science rather than fantasy due to Astronomer Royal Nevil Maskelyne's experiments to work out the weight of the earth in 1774. 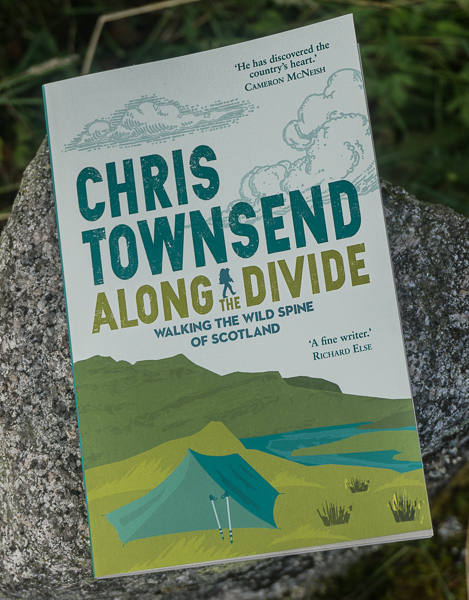 On the same expedition mathematician Charles Hutton came up with the idea of contour lines, for which all hill walkers should give thanks. An isolated hill, Schiehallion is prominent from far afield, often appearing as a distinctive and easily identifiable conical mountain. 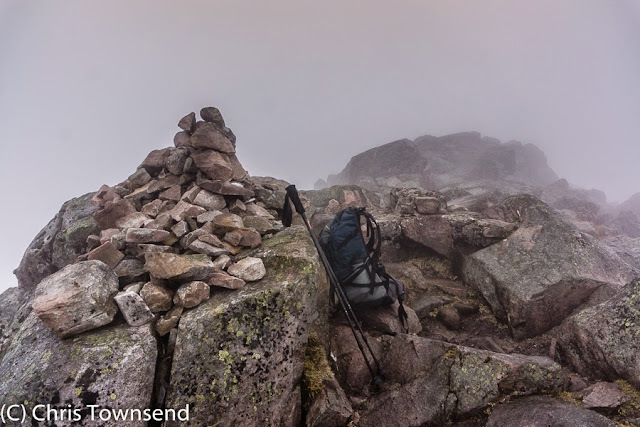 Steep-sided and with the upper slopes covered in quartzite boulders that are greasy when wet it's not the easiest hill to climb, especially in stormy weather. On the east side a good path, built by the John Muir Trust to replace the old badly-eroded one, winds up the lower and middle slopes then fizzles out when the rocky terrain is reached. With the clouds descending over the summit, the wind picking up and the showers becoming heavier this was the route I took, up and down, abandoning my idea of descending the pathless southern slopes and walking back through Gleann Mor. As the path faded so did the visibility as the clouds swept over me. The squalls were now bitterly cold and the rocks were becoming increasingly slippery. Ahead I could see a group of dark figures plodding up a big snowfield. After they vanished into the dense mist I caught up with a solo walker, or so I thought, who was not dealing too well with the rocks. As I approached she let out an agonised cry and slumped down onto a boulder. For a brief moment I thought I might need to assist but she turned and told me her calf was sore but she'd be alright in a minute. I chatted with her for a few minutes until she felt able to continue. I'm with a school group she told me but they've disappeared into the mist and left me behind. They shouldn't do that, it's dangerous, we should stay in sight of each other. I agreed. At the summit I found the school group sitting round the cairn. There was one adult, who asked me if I'd seen a woman. Yes, I replied. Had she given up or was she still coming up? I said she wasn't far behind me, thinking he was setting a really bad example to his pupils by leaving his fellow teacher behind and seemingly not too bothered about what might have happened to her. Soon reunited the school group set off back down. I lingered on the summit, sheltering behind a boulder while I had a snack and donned warm clothing. Mid May and I needed hat, gloves and fleece. The rain was icy, the wind strengthening. Visibility was down to ten or so metres. Starting to feel cold I accepted there would be no clearance and set off back down, slipping and slithering over the wet rocks to the path and then on in the mist, much lower now, until finally I dropped below it to a view of a dark sodden landscape. A day to remind me of the Watershed walk, I thought. 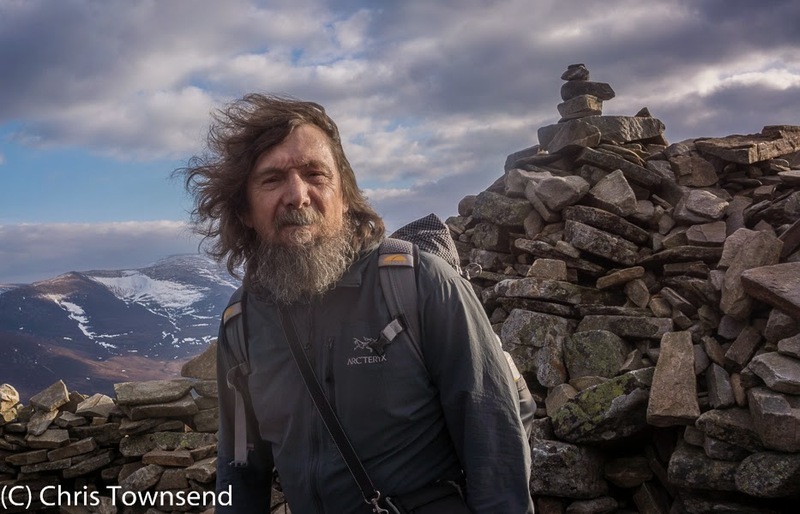 Back in March I went for a walk with outdoorsman and bushcraft instructor Paul Kirtley (see this post), during which Paul interviewed me for a podcast which is now available here. I hope you enjoy the interview and thanks to Paul for producing the podcast. 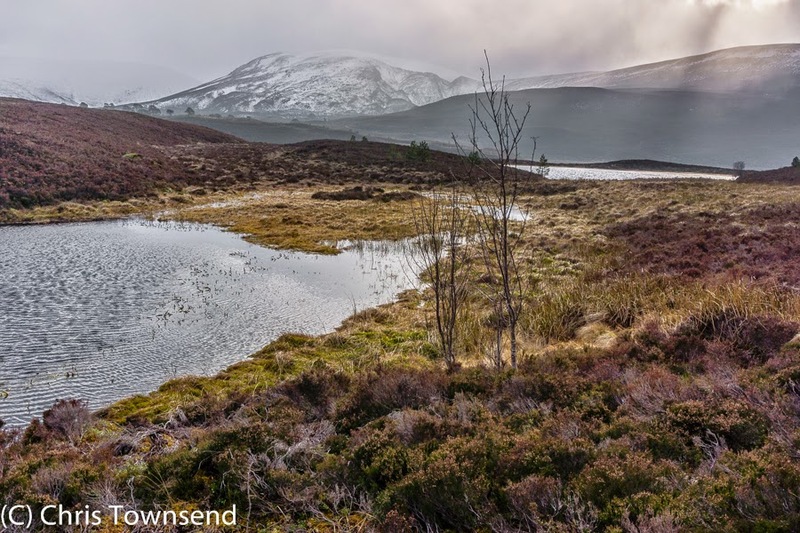 Grantown Nature Festival, May 16th - Scottish Watershed Talk. On Saturday May 16th my excellent local bookshop, The Bookmark, is organising a festival of talks by five nature writers, including myself. (Am I a nature writer? In some respects I guess so). I'll be talking about my Scottish Watershed walk. The Bookmark has produced a really nice poster for the event which you can find in the box below. My computer skills failed to enlarge it to page size so I've pasted the information here. I don't know where the description of myself as 'mountaineer and pathfinder'comes from! 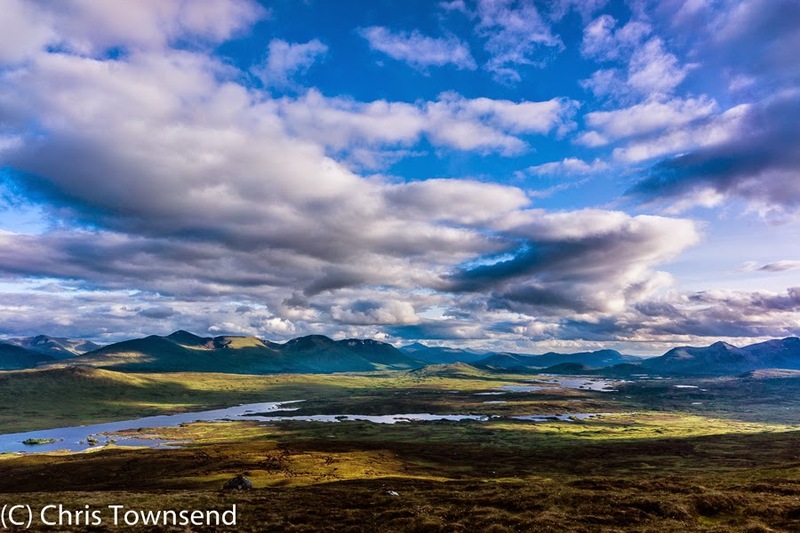 Join us for a lively and unforgettable day with Scotland’s foremost nature writers and speakers on our stunning landscapes, wildlife, and sustainable ways to engage with our wild spaces. A rare opportunity to meet authoritative experts in conservation, biodiversity, species reintroductions, photography and foraging. A surprise package arrived in the post today. 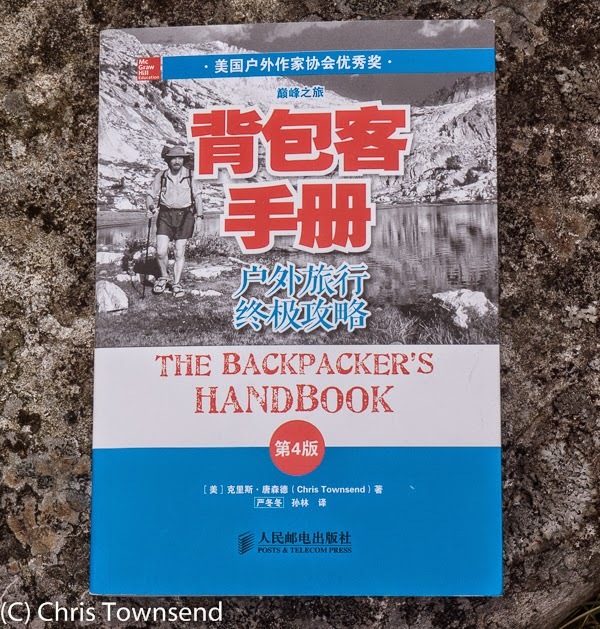 A Chinese edition of The Backpacker's Handbook. I had heard last year that such a version existed and I did ask the publishers about it but heard nothing until today. It's a big book, some hundred pages longer than the English version. I can't read it of course but it does look good! As far as I know this is the first time any of my books have been translated into another language. I must admit I never thought the first one would be Chinese. I presume the gentleman pictured on the flyleaf must be the translator. To him, many thanks. 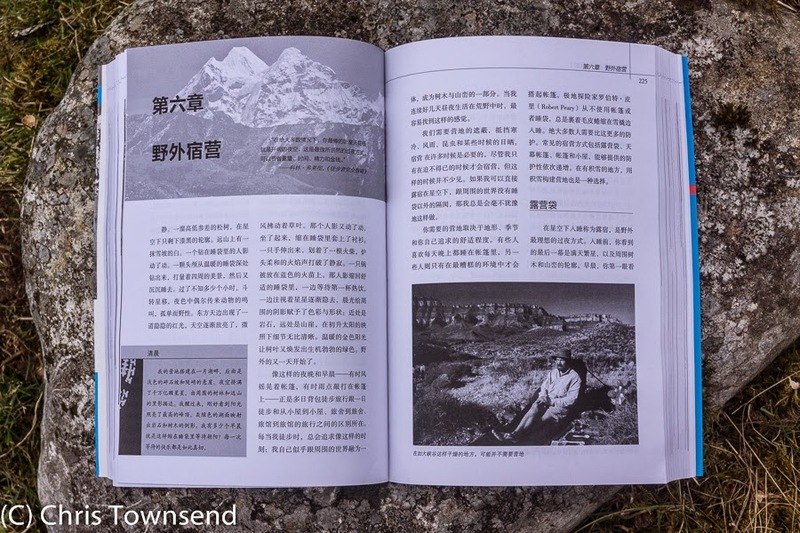 I find it quite startling and flattering that my book is available in Chinese in China. In a note in English it says that this edition is jointly published by McGraw-Hill Education (Asia) and Post and Telecommunications Press. A Google search reveals that the latter is a big Chinese publisher founded in 1953. 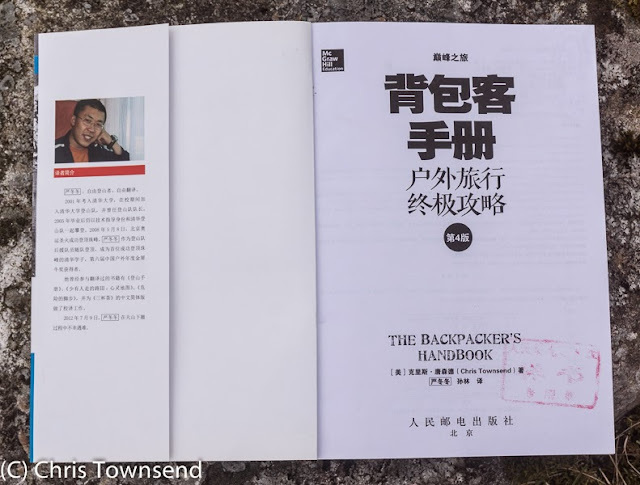 The note also says that this edition is only authorized for sale in the People's Republic of China, excluding Hong Kong, Macao and Taiwan. 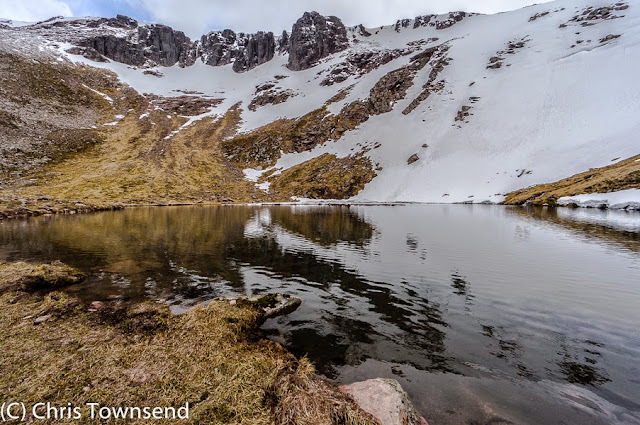 I'll be giving an illustrated talk on my Scottish Watershed walk at the Birnam Arts and Conference Centre at 7.30 p.m. on May 14th. The cost is £5. Booking info here.